1. 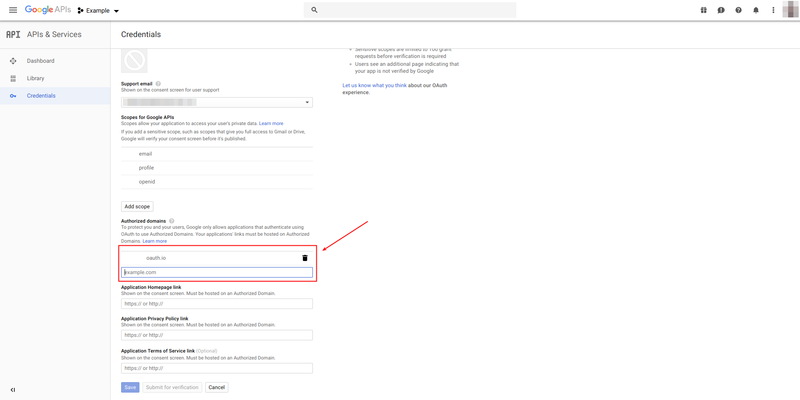 Goto https://www.google.com, and press 'Sign In' button. 2. Enter your email or phone. 3. Enter your password and click 'Next'. 4. Goto https://console.developers.google.com/projectselector/apis/dashboard, and click 'Create' button. 5. After redirecting to the new page, input your project name and your organization data. Click 'CREATE' button. 7. Once your application is ready, click on dropdown(1), chose your organization(2) and project you have created(3). 8. Go to dashboard and click on 'ENABLE API AND SERVICES'. 9. Search for API you want to use and enable it. 10. Click on credentials on the left menu. 11. Open 'OAuth consent screen' tab, input all of the information about your application. 12. Add oauth.io to an authorized domain. 13. Open Credentials tab, click 'Create credentials' and choose OAuth client ID. 15. After clicking 'Create' button, your application credentials will be shown.